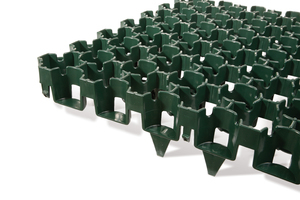 Porous plastic grass pavers are an interlocking ground stabilisation system designed to protect grass from damage caused by vehicle wheels when moving. Permeable plastic grass pavers are most commonly used for regular used grass car parks, stopping muddy areas forming, worn grass and cars getting stuck in the mud! 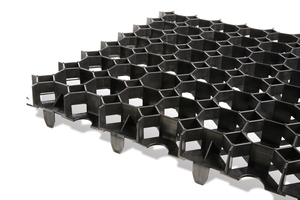 Porous grass paving grids are manufactured from recycled plastic, porous grass pavers have an open cell structure which allow them to be laid onto a prepared sub-base and root zone layer and filled with soil and seeded. 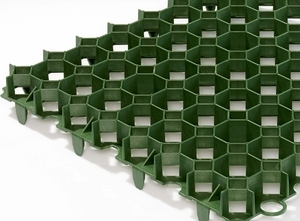 The open cell structure within the plastic paving grids allow unrestricted root grow from cell-to-cell, free water and oxygen movement - ideal for optimum water and nutrients to the grass. 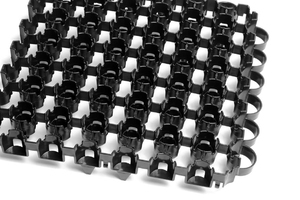 Individual plastic grass pavers are 50cmx50cm and are we offer a 40mm and 50mm deep paver. The 50mm paver is ideal for more frequent use as it provides nearly double the amount of ground stabilisation. Both products have ground spikes, designed to resist dynamic lateral movement of the paving surface caused by the dynamic forces a car or lorry exerts as it travels or turns. Grass pavers support vehicle loads, by spreading the weight more evenly while protecting the grass roots from damage. As the pavers are have an open cell structure, rainwater and storm water is allowed to drain through the grass into the sub-base below. Plastic pavers are an ideal source control loading bearing surface as part of a sustainable urban drainage system (SuDS).